This Vintage Dateless Planner is not only very classy, its being dateless gives its advantage. Technically, being dateless means I can still keep this and use it anytime I wish, even up till next year... but it would be such a waste keeping it that long. Now, you can have it... yes, you... I'm giving this away. It has a dateless monthly and weekly layout plus a couple of notes pages inside. Really, really lovely I tell you. Aside from that, I decided to kick in and pair it with 3pcs. of awesome, very popular vintage rings. Isn't that great??? Now, all you have to do is follow the instructions and fill up this rafflecopter to make your entries count. But most importantly, make sure you follow me on Tumblr and reblog! Thanks and Good luck everyone!!! My greatest goal for 2012 is to put myself in a timeout weekly. I need to take a much-needed break from my daily responsibilities of raising my only angel and other household chores. I would like to take fun activities I enjoy like shopping, watching movies or going to the salon maybe. It will help me rejuvenate and to be more effective in my role as mother and wife. My greatest goal for 2012 is just to save more and earn more not only on online work but with offline work. I want to finish little by little the construction of my house from these earnings. What's your greatest goal for 2012? My greatest goal for 2012 is to prove to myself, to my family, to my friends and to God that I really suits my course Accountancy no matter how hard it seems like to everyone..
My goal for 2012 is to live each day to it's fullest and work hard for my dreams! My greatest goal for 2012 is to be happy and contented.Appreciate all the blessing that come and enjoy the life. -->my Greatest Goal for 2012 is to excel in everything that my heart desires. I want to be the best entrepreneur in my town and I want to be the most dedicated mother of all times. My greatest goal for this year is to earn more and love more. I'm not getting any younger so I'll get focused and concentrate more on my career without compromising my relationships. Happy 2012 everyone! Good luck to those who will join. Happy New year! may dateless planner pala, ok nga siya kasi magagamit mo anytime pero mas feel ko yung may date. =) good luck sa mga kasali. "Dateless planner" is beneficial to those who are holding an executive position, who are always in the go and also school heads. When regards to my greatest goal for 2012 is simply to be true to myself. If I'm honest to myself, I'm do likewise to others. a planner, hope to have one. it may make things easier for me... me and my disorganized thoughts (psycho)... lol. Yahweh bless. Cool new year giveaway! My greatest goal for 2012 is to make more friends! HAHAHA. I joined! Hoping to win! good luck to the prospect winners! 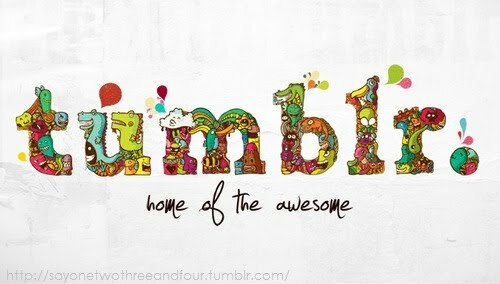 i'd love to join.. :(( but i don't have tumbl.r account...huhuhu! hi everyone! keep your entries coming.. Gluck! To earn more thru online. Win gadgets in contests. 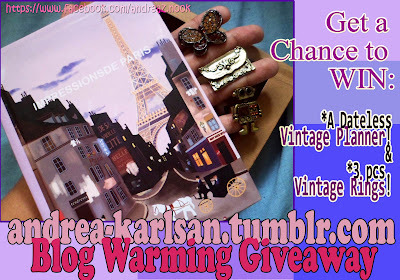 Tumblr Blogwarming Giveaway Prize Received!